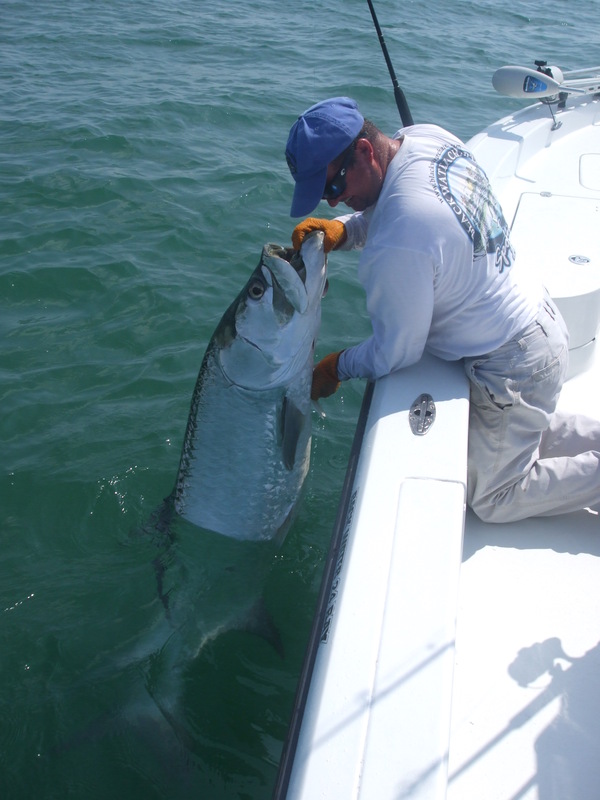 Florida fishing guides, tarpon fishing charters in Florida. I'm Capt. Scott Hughes. 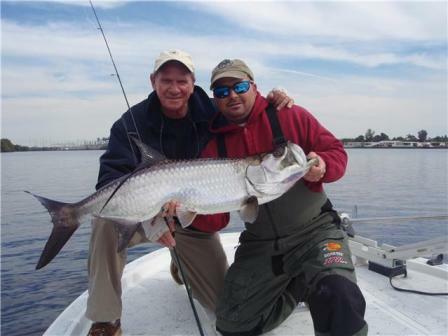 Come make a memory with a exciting fishing trip in Southwest Florida. I specialize in light tackle saltwater, and fly fishing from the backcountry of Charlotte Harbor to flats of Pine Island Sound and Boca Grande. All of my backcountry 4,6 or 8hr flats charters and 12hr all-day Tarpon Charters are No Fish, No Pay! If you do not catch a game fish (or jump a tarpon on all-day trip) on your charter then there is no charge for the trip. I have pick-up locations at Burnt Store Marina, Pine Island, Punta Gorda and Boca Grande. I like to target big fish. During warm months, tarpon, sharks, snook, redfish, cobia, black drum, king mackerel and big jacks are the main species sought after. Most of the winter months are devoted to redfish, trout, snook and grouper. Whether your a beginner or a seasoned pro, I am an instructional guide who will provide the knowledge and techniques needed for a successful and enjoyable fishing trip. No Fish, No Pay! Including Tarpon Fishing! That's me releasing a tarpon caught in Charlotte Harbor near Boca Grande Pass. I have organized my website to help you make an informed decision about choosing a captain and organizing your trip. Please browse the website to answer any questions you might have. I have been a full-time guide since 1998 and have a large repeat client base. I get very busy during certain times of the year. If you like what I have to offer please try to book with as much advance notice as possible to assure of an available date. 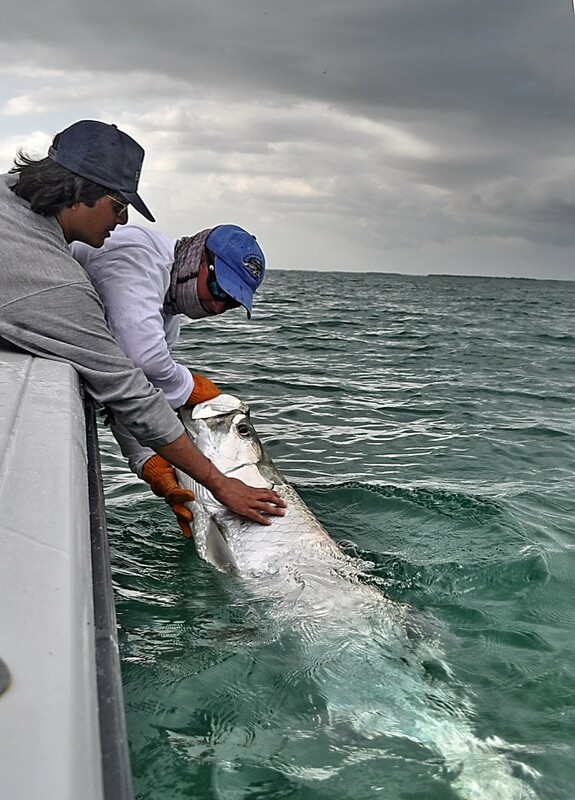 April, May and June tarpon trips should to be booked a few months in advance or as soon as possible since these dates are the most sought after of the year. After browsing the rest of the pages, find out what's biting by reading my fishing report. I report on what we have been catching in Southwest Florida from Charlotte Harbor to Ft Myers, Boca Grande and Marco Island. I try to update the report every week or two. We landed 4 tarpon in the 200-220 pound range this week. 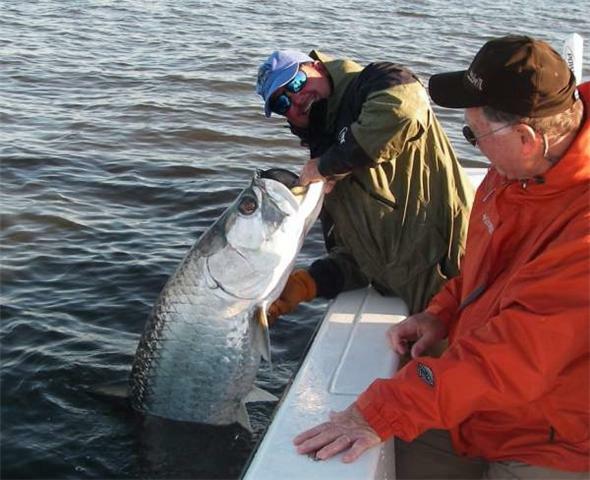 This tarpon was one of three giant 200 pound class fish that Paul Voisin caught in one 6hr trip. This large female tarpon was caught on the flats of Pine Island Sound. This tarpon was caught during a cold front in April. 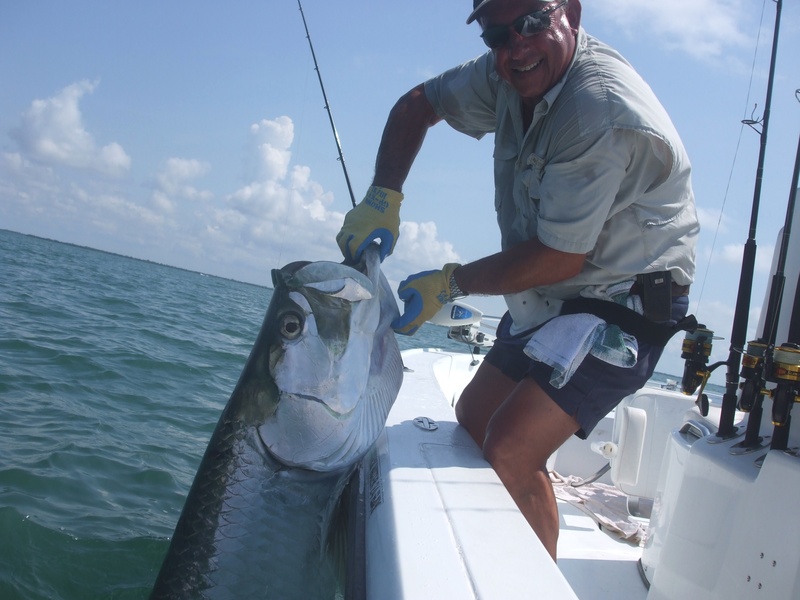 This tarpon is the typical catch for late summer "Blackwater" tarpon fishing here in Southwest Florida. My tarpon fishing for this season ended on October 31st. Right now I am catching redfish, speckled trout and flounder on the flats of Pine Island Sound and Charlotte Harbor. (updated 2-2-15). Check out the Fishing Report for more details. A nice Tarpon caught in Boca Grande Pass in July. Check out these tarpon fishing photos customers sent me from the 2013 fishing season. 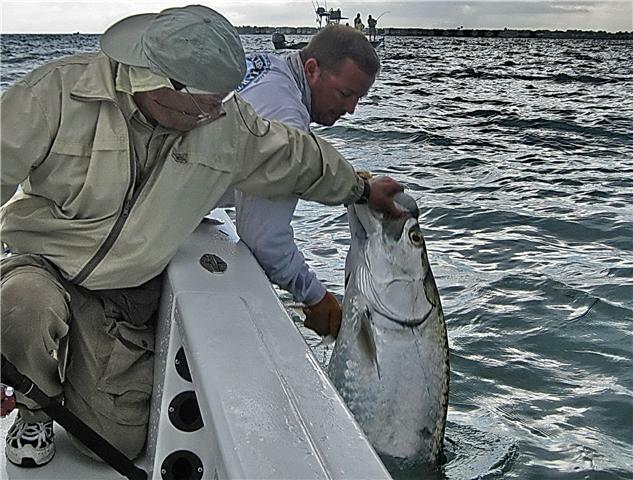 This is what tarpon angler dream about. Flat calm waters as the sun rises on the eastern shore of Charlotte Harbor. This was the last tarpon charter that i had that season. It was the third week of October. This picture is over 10years old but I just received it from my customer this past season. If I remember correctly, we caught this tarpon on a crab while sight fishing on the beach of Cayo Costa to the south of Boca Grande Pass. The school had already swam past the boat and the angler made a "hail Mary" cast to the last fish and it ate the crab. We landed the tarpon right where we took this photo. Due to a high number of spam e-mails, I miss a lot of important messages from potential customers so if your serious about booking a fishing charter I'd suggest you give me a call or at least put "booking request" or "fishing charter info" in the title of your e-mail. Thanks. Make a Memory! 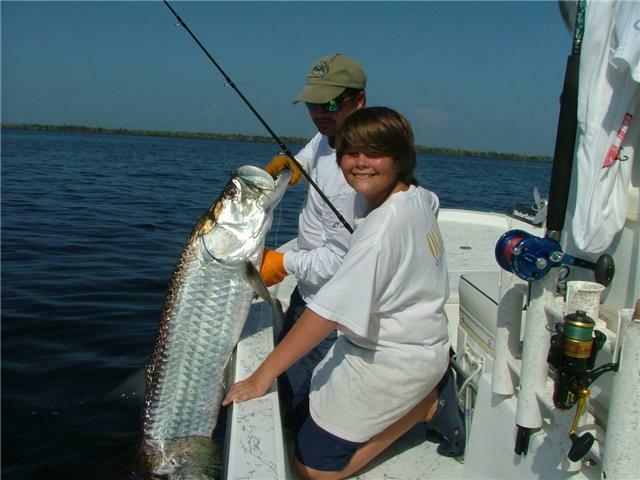 Go on a Southwest Florida Tarpon Charter in 2010. I am now booking 2018 tarpon dates for April , May, June and July . If we don't "jump" at least one tarpon on a all-day 12hr Tarpon Charter there will be no charge for the trip. Standard 8hr and 10hr trips are also available. Pick up some of my fishing clothes when your here for a fishing charter. I have long and short sleeve t-shirts and kaki and blue hats with my company logo on the front and back. *Try some of our late "off season" redfish and snook fishing. I recommend Charlotte Harbor for excellent snook fishing and Pine Island for bull redfish. Excellent fishing with reasonable rates for trips and lodging! July-December. * Or try some sight fishing on the flats of Pine Island Sound. We fish out of a shallow daft poling skiff for redfish, trout and sharks with very light tackle. Best sight fishing is November through February. 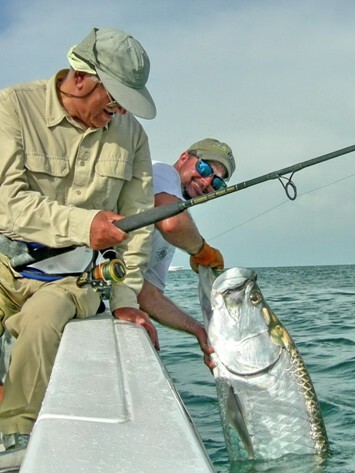 *If you can't fit in a tarpon fishing trip this spring don't forget that some of the best tarpon fishing of the year is July through the end of September and many times October through early November is good also. As an added bonus, the lodging rates are the lowest of the year! Photo Album's What we Catch! Tournament Trails and Standings Tarpon Fishing!